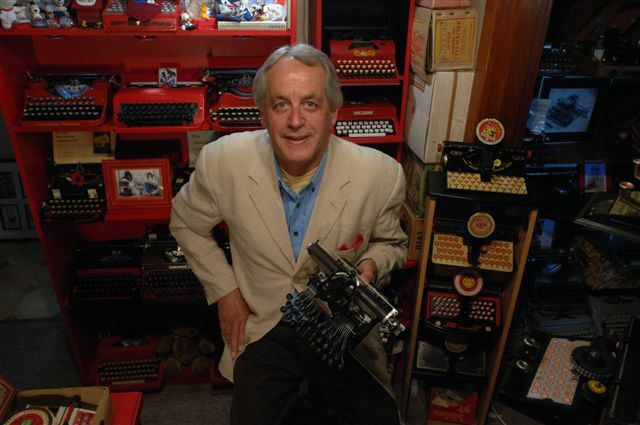 One has to hand it to indefatigable Imperial typewriter collector Richard Amery, of Sydney. He’s nothing if not persistent in his relentless quest to find out what became of his beloved typewriter company. “The truth is out there,” I can hear him cry. He still believes there are questions to be answered. “What became of the … names Royal, Adler, Imperial as far as branded portable manual typewriters from 1979 on?” Richard asked in a comment on my last post. I thought that had been adequately answered somewhere in the last three posts, but maybe not. 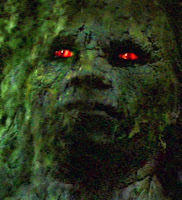 Well, just as Fox Mulder found there are some unspeakably ugly creatures “out there”, I’m afraid the awful reality about Imperial is similarly none too pretty. Richard is one of those few good men, but can he handle the heartbreaking truth? 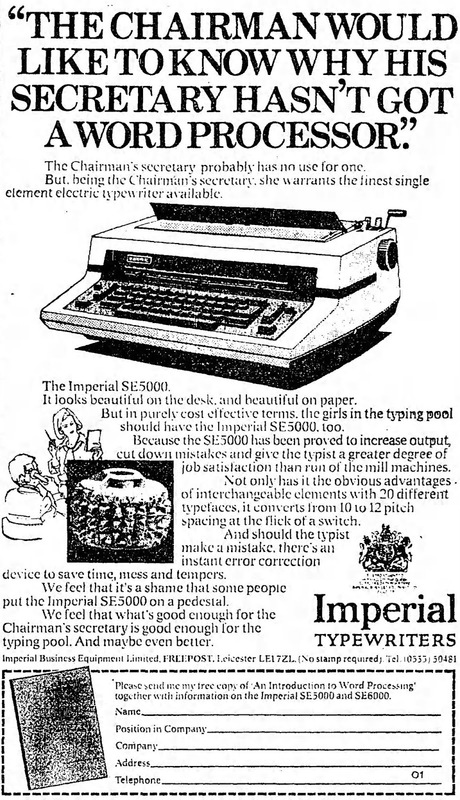 Which is that no manual typewriter was made in the Imperial name after Litton Industries sold the brand to Volkswagen in 1979, and none after VW sold it to Olivetti in 1986. Tragically, it’s that simple. Imperial manual typewriters were dead and gone by 1979. One of the main reasons for this is that as part of the Litton-VW deal, Volkswagen acquired an 11 per cent holding in a British company called Office and Electronic Machines, which had already been given British and Irish distribution rights to Adler and Triumph typewriters by Litton in 1973. VW obviously foresaw limited use of the Imperial nameplate (as it also did with the individual Triumph nameplate) and had decided to put its faith almost exclusively in the TA brand name and logo, including in Britain, Canada and Australia. 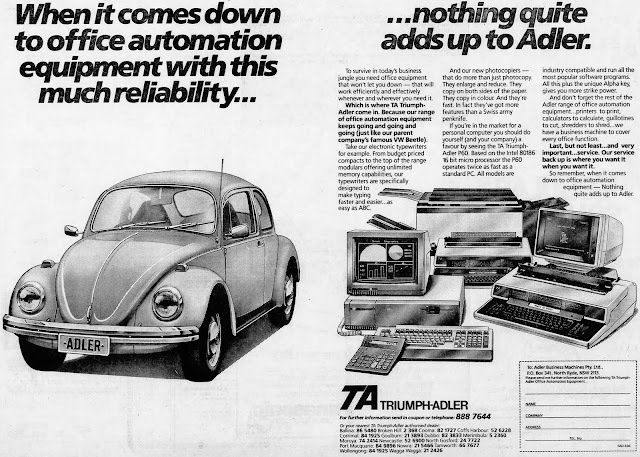 In Australia, where the company became known as Adler Business Machines Pty Ltd, TA even advertised on the back of VW’s reputation for car manufacturing. So VW, already burdened with manual typewriters at a time when they were starting to be phased out, was more than happy to hand the Imperial nameplate to OEM. Imperial's Hull factory in 1971. 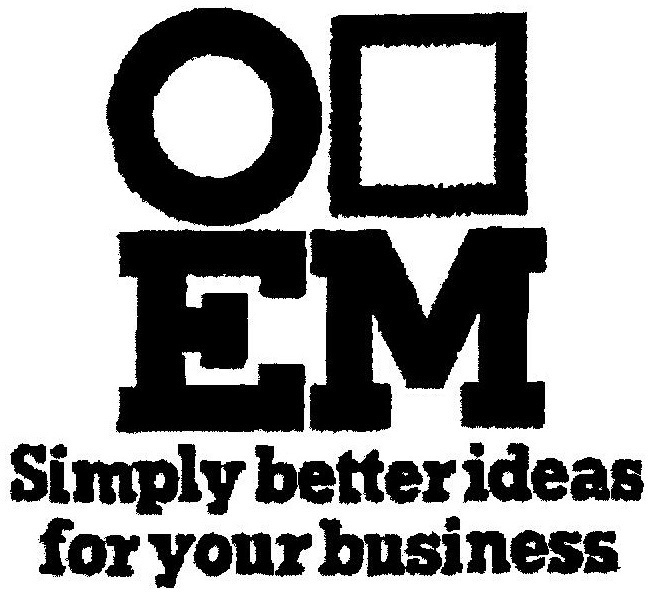 OEM, incorporated in 1950, took over the business of the Imperial Typewriter Company on March 1, 1975, a week after Litton had closed the last Imperial factory, on Hedon Road in Hull. 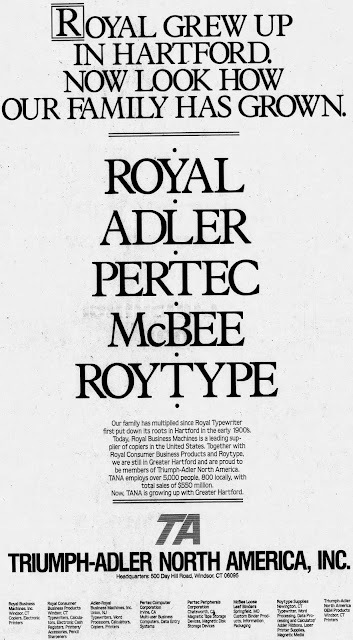 OEM changed Imperial’s name to Imperial Business Equipment, headquartered in Leicester, though interestingly it continued to incorporate the British royal warrant in its British advertising. Trouble at mill in Hull followed strike action in Leicester in 1974. OEM’s existing position as an importer and distributor of Adler and Triumph typewriters in Britain caused considerable angst during the industrial dispute which followed the closure of Imperial’s Hull factory. Laid off workers wanted to continue making Imperial typewriters themselves, but ran into the problem of distribution. A statement from the workers asked, “If the factories [Hull and Leicester] are to be viable, a distribution mechanism must be found which can market their product. 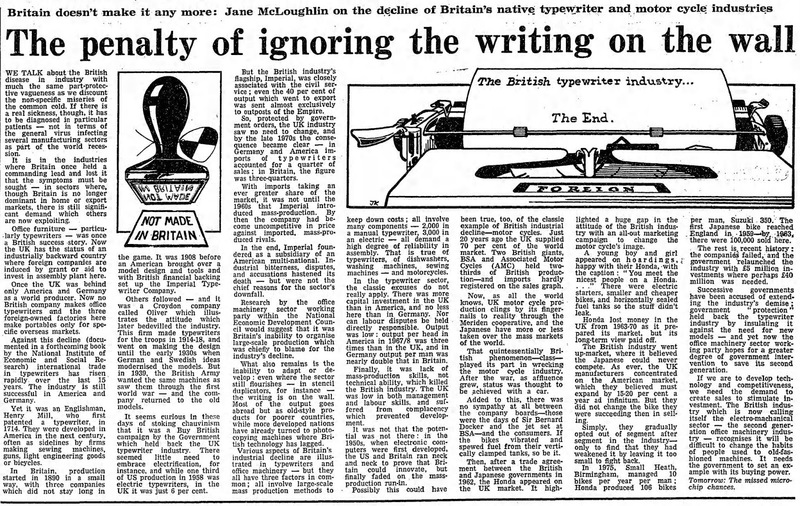 At the moment, Litton thinks that it can pull out of producing machines in Britain and yet retain the absolute right to market in the United Kingdom the typewriters which they manufacture abroad. Once the idea of a workers’ typewriter factory had died its natural death, one ton (yep, 907 kilograms, no less) of Imperial Typewriter Company files were purchased by Peter Tytell, left, son of “Mr Typewriter, New York” Martin Tytell and himself a forensic typewritten document expert. 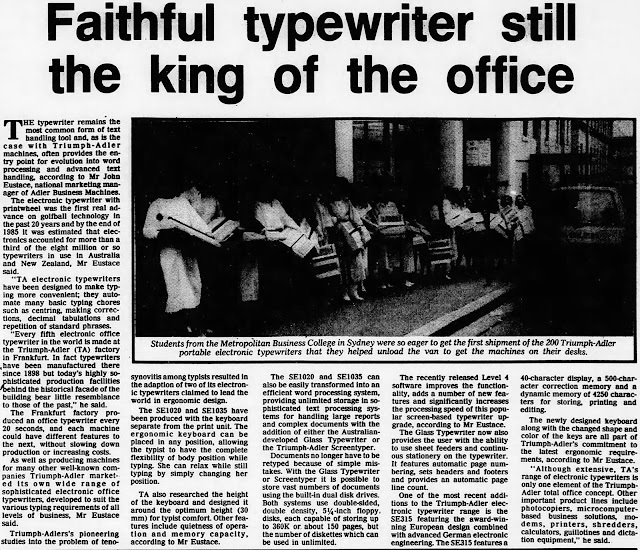 The Imperial files were shipped back to the Tytell Typewriter Company’s second-floor office-laboratory-warehouse-workshop on 116 Fulton Street, Lower Manhattan, near the Trump Building on Wall Street. Peter Tytell’s purchase was one of the few times in the period between 1979 and 1986 that Triumph-Adler or Volkswagen had anything to show for VW’s initial $26 million investment in Litton’s typewriter division. Put bluntly, the whole exercise was a total disaster. In 1986 a Reuters story in the San Francisco Examiner estimated the total of losses suffered by TA was $750 million in a crippling seven-year period. The Examiner quoted analysts as saying “TA might never have become truly profitable while it remained with VW”. Yet as the parent company, VW had to bear that overall cost, while the market failure was down to Triumph-Adler. OEM’s losses from whatever loyalty it had to the Imperial brand name paled by comparison, but in the end OEM had to abandon its Imperial typewriters in 1986, and never truly recovered. After three appointments of voluntary liquidators in seven years, OEM finally bit the dust in January this year. At the time of the Litton-VW deal being announced, it was said that Triumph-Adler would “continue to operate with complete independence”. VW added that TA’s “activities will continue unchanged and fully independent”. Which meant that TA could deal with OEM on its own accord, including allowing OEM to use the Imperial nameplate and royal warrant. It should be noted that both Imperial and Royal were wholly-owned subsidiaries of TA, therefore TA could make decisions for the two brands without VW’s involvement. OEM continued to use the Imperial brand name for another seven years. The last typewriter sold as an Imperial was a beast called the SE 5000 CD. It was a copycat golfball machine marketed in Britain and Australia in 1979 by Imperial Business Equipment Ltd. The SE 5000 CD was also being labelled by manufacturers Triumphwerke Nuremberg GMBH as a Royal. It was already being made at the time Litton sold a controlling 55 per cent interest in its typewriter division to Volkswagen, on March 9, 1979 (authorised by the West German Government, June 12). It was sold in Australia by Raitt Adams, a company headed by George Raitt which merged Imperial’s dealers in Sydney, Adelaide and Perth. About seven years ago, someone in Dunshaughlin, County Meath, was selling one of these Imperial SE 5000 CDs for 100 euros. It came with a “Pipman Wamsley” (sic) commercial typewriter handbook, a cover, a mat and a cleaning brush. Not sure if the enticing package is still available, but the cost of freight to Sydney would be enormous. Still, Dunshaughlin (or more specifically, the townland of Lagore) is famous for an ancient crannóg from the 7th century, where a number of Irish antiquities were discovered. Maybe one day in the far distant future cultural archaeologists will find the SE 5000 CD there, too. OEM used Imperial and Adler typewriters when in 1986 it developed the Screentyper, the first office word-processing system that integrated “user-friendly” typewriters with screen data processing, with optional telex and electronic mail handling. The system was based on a Z80A microprocessor with 64K of memory and run by OEM's own developed operating system. 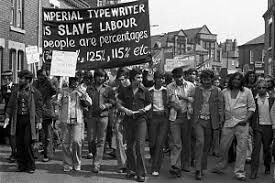 This was the last time the nameplate “Imperial” appeared on new typewriters. 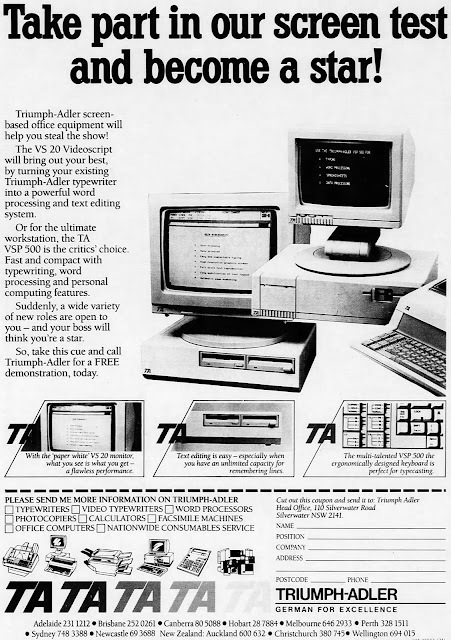 In 1988 the Screentyper turned into the TA VS 20 Videoscript system and TA’s “ultimate electronic typewriter” was the SE 525 with expandable memory. It has to be accepted, regardless of our present-day feelings on the subject, that in 1979 both Litton and VW were far, far more interested in the growing market of electric and electronic typewriters than they were in continuing to make manual typewriters. 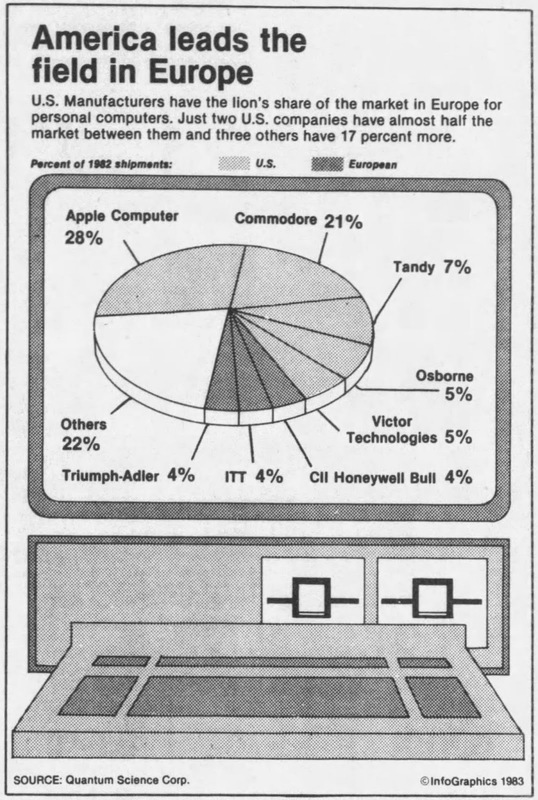 This was especially so as part of the development toward small business and home computers (remembering the Commodore 64 didn’t come out until 1982, and went on to sell in the tens of millions). 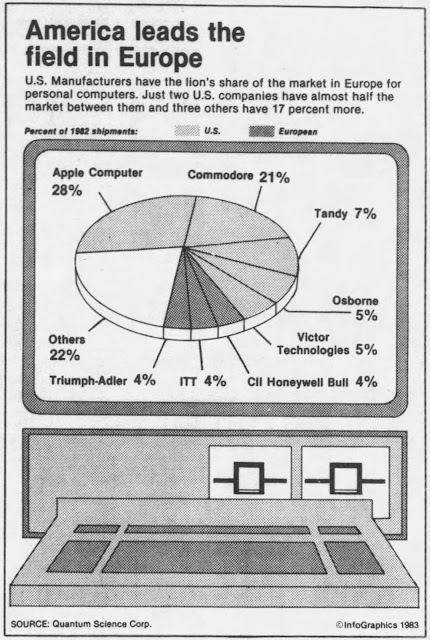 Before taking a majority holding in Triumph-Adler, VW had been turned down in a takeover bid for Nixdorf Computer AG, West Germany’s biggest computer marker and the fourth largest in Europe (founder Heinz Nixdorf had worked for Remington Rand). VW’s TA undertaking was, pointedly, described as “almost a second thought”. 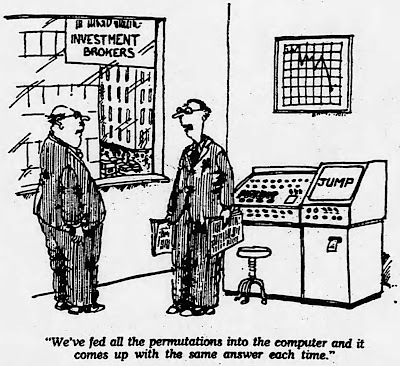 These included first Triumph-Adler as well as in October 1979 outbidding, to the tune of $120 million, Dutch concern NV Philips for Pertec Computer, a producer of small computer systems which led the world in computer-aided design and manufacturing automation systems. VW was also eyeing companies with expertise in digital communications. Pertec originally designed and manufactured peripherals such as floppy drives, tape drives, instrumentation control and other hardware for computers. 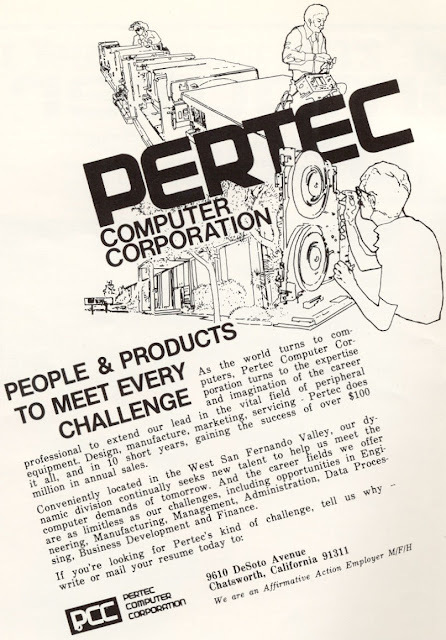 Its most successful products were hard disk drives and tape drives, which were sold as OEM to computer manufacturers, including IBM, Siemens and DEC. Pertec bought MITS, the manufacturers of the MITS Altair computer, for $6.5 million in 1976 and became involved in the manufacturing of microprocessor-based computers. It released the MITS 300 in 1977, a system which allowed for the Teletypewriter. Pertec's final in-house computer design, the MC68000-based Series 3200, was extremely advanced for the time. Soon after Triumph-Adler’s takeover, TA marketed the system in Europe under its own brand with the model name MSX 3200. 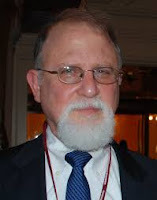 In 1980 TA added Amdahl’s Eugene R. White to its board – Amdahl was an IT company which specialised in IBM mainframe-compatible computer products. White joined Pertec’s Ryal R. Poppa, left, who in 1981 was succeeded by Robert R. Nagy, president of Royal Business Machines, who became head of Pertec as well as Royal, and CEO of TA North America. Nagy was replaced by Edward E. Hale in 1984, with John E. Stuart becoming president of Royal. By 1981 VW had lifted its stake in TA from an original 55 per cent to 98.4 per cent. And it was very much ruing having done so. TA, which had net earnings of $10.9 million in 1979, lost $47.5 million in 1980. Naturally, when VW reported in October 1981 a $12.5 million second quarter loss, its first loss since 1975, it largely blamed TA. VW financial director Friedrich Thomée, taking the heat of harsh criticism for his stewardship as policy board chairman of TA, resigned in December. To make matters worse, Rank Xerox had decided to join the electronic typewriter market in November (3M added itself to the field in 1982). TA was certainly in trouble, and had closed its Frankfurt plant and laid off 2800 workers in September 1981. Things didn’t improve in 1983, when losses of $11 to $13 million were still expected by TA, albeit these were a two-thirds reduction from 1982. On top of this a prolonged nation-wide cross-industry strike in West Germany in May halted TA production. Judging by its determination to hold on to TA North America, the United States was possibly the one remaining bright spot for TA when Olivetti bought VW’s 98.4 per cent holding in the West German outfit in April 1986 (VW got a 5 per cent stake in Olivetti in exchange). Worldwide in 1985 TA had sales of almost $1 billion yet still lost $60 million. TA North America had already sold Royal Business Machines to Konishiroku Photo Industry Co in January 1986 (Konishiroku took a 34 per cent stake in 1984) and Royal was renamed Konica Business Machines USA. But in the Olivetti takeover, VW initially held on to TA North America (which owned Triumph-Adler-Royal Business Machines) and Pertec. The fact that Olivetti spent $68 million on 98.4 per cent of TA while it cost VW $280 million for 5 per cent of Olivetti says it all, really. And perhaps Reuters was right – with TA in its stable, Olivetti announced in May 1987 that its profit rose 12 per cent to $274.6 million. Yet a year later Olivetti’s profit fell sharply because of losses at TA, with earnings falling 29 per cent. In 1990 the Olivetti Computer Group cut its worldwide staff by 7000, including 4000 in Italy, citing weak demand for its product. 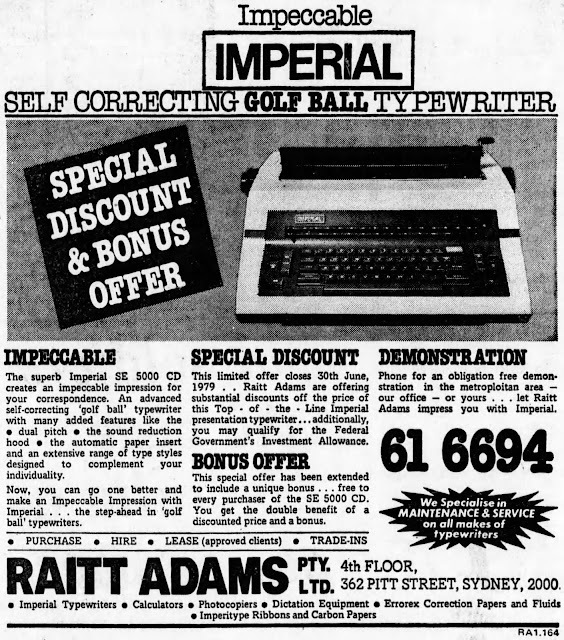 On June 30, 1994, John Alexander Teong, secretary of Imperial Typewriter Sales Pty Ltd in Sydney, declared the company dissolved. It hadn’t been doing any business for more than a decade. Hi Robert, I wish I could collect all your information on this subject and file it together. Better still, how about another book. Your research is fantastic. That said, I still have one more question for you or any of your readers. 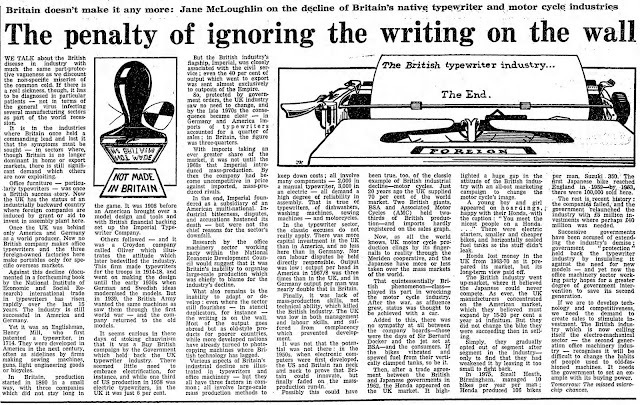 I refer to the Oz Typewriter blog of the 20th March 2015. THis post related to your Imperial 90, which is now in my collection. 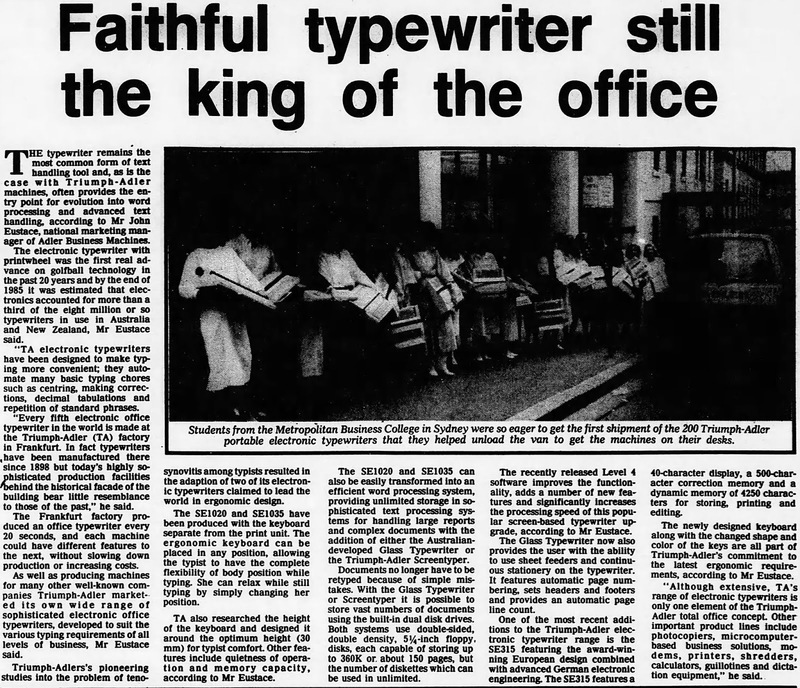 A response to that article was from Tom Lucas-'The typewriter man.' He said in part that there was also an Imperial 95. It was made in Bulgaria, was similar to a Hermes 3000 and was new in 1985. 1985! can that be true?. Before your post, like you, I had never heard of an Imperial 90. I still have seen no evidence of an Imperial 95. Can you or any of your readers add anything to the information supplied by Tom Lucas back in 2015? These were certainly tumultous times in the rapidly changing office equipment industry. That Imperial-branded "golf ball" machine: it wasn't just an IBM clone, was it? 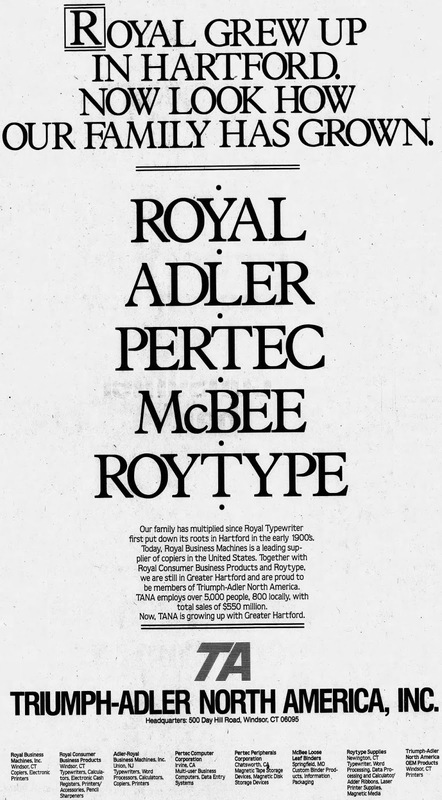 The element shown in the ad looks less spherical than an IBM Selectric element. I remember those days of all the different companies coming and going. Only a decade or so later a similar happening to all the computer makers. I love the last column: The Society of Obsolescence. Perhaps we should start one for typewriters, slide rules, fountain pens, and many thing of the past that are still with us. Agreed, Bill, I like the name Society of Obsolescence, but I guess it's at odds with the Typewriter Revolution, a bit like lying down and conceding defeat? Richard P, you're right about the type element. When you look at it in photos in the machine it looks more like the Blick element, more like a drum. Elsewhere TA and its various subsidiaries worked closely with IBM on some projects, and I seem to recall mention that some IBM parts were interchangable with other golfball models. Richard A: I guess we (or at least I) probably should have stipulated somewhere that we are talking about typewriters building under the aegis of Imperial, either the ITC itself or Litton]/TA. I suspect Eastern Bloc countries felt it was OK to label machines with any name they felt like using, and ignoring the laws which governed such things in the West. Remember that white Robotron Imperial (30?)?. If such a thing as an Imperial 95 exists - which somehow I doubt - and, as you say, it was made in Bulgaria, it's more than likely that it had nothing at all to do with Imperial, TA or VW. As I said in a comment on an earlier post, Bugaria was certainly the last country in Europe still making typewriters, and well into the 21st Century. I wonder if your Maritsa 11/Good Companion 75 comes under this category? You may be aware there was mention in what I think was the latest edition of Mike Brown's Typex online magazine, in an article by Nick Fisher in England, about a Maritsa 11 masquerading as an "Impex", which he says was an export name. It appears to be derived from Imperial/export. Impex-labelled Optimas were sold in the US, and I think Richard Polt may have one. Obviously nothing to do with Imperial, of course, but curious nonetheless. You will no doubt have noticed the nameplate on the SE 5000 CD is the same as the one on your Imperial 90 and your Imperial Caravan. Yes, you're right about an Imperial history book, and when it's written it will obviously have to include all this post-1979 stuff. Thanks. Thanks Robert for the continued information and patience. In relation to your reference to Bulgarian Imperial, I don't think it would be a eastern block abuse of patent as the sticker uses both the Good Companion model name and the Litton logo. I would place this machine somewhere from the mid 1970s to the end of the Litton era.By the end of the Litton era, I they were sticking the Imperial label on many machines from the four corners of the globe. You have alerted me to the nameplate on the SE5000CD. Yes it is the same as the 90 and the Caravan. Your blog information steers us towards this being made by the German concern, again without the Litton logo.